We start our school day with a few poems. It’s the perfect way to ease into learning. My kids love our tradition and look forward to our poetry time. They’re even starting to recognize many of the authors and their works. I keep our poetry time very low-key. We sometimes have a very brief discussion about the poem; however, I chose to focus on the overall enjoyment of poetry rather than attempting to analyze it with them at these ages. If you’re looking for a few poetry books to start your own poetry time, here are a few of our favorites! Do you read poetry in your homeschool? What are your favorite poetry books? Thank you for this. 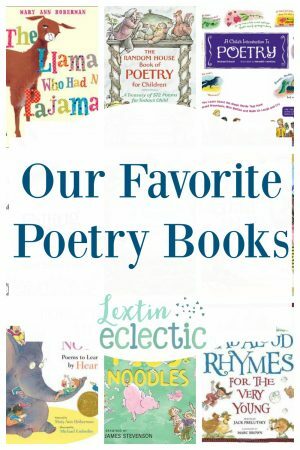 We like poetry and some of these books are new to me. A couple of our favourites are quite English and may be unfamiliar to you: Shirley Hughes' beautiful book "Out and About" and the poems about the British monarchy called "Kings and Queens" by Eleanor and Herbert Farjeon.